Yui Yaegashi "Manner and Preparation"
MISAKO & ROSEN is pleased to announce Yui Yaegashi's second solo exhibition with the gallery - "Manner and Preparation". Yaegashi was born (1985) in Chiba, Japan and presently lives and works in Tokyo. Yaegashi is a participant in the exhibition "The Way of Painting" on view at Tokyo Opera City Art Gallery though September 21. 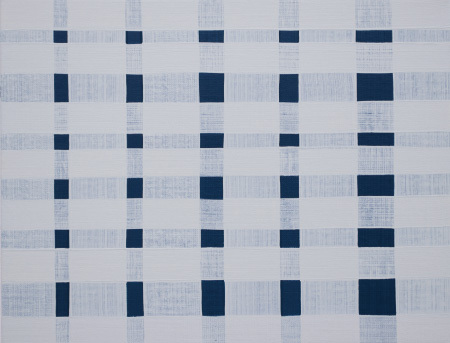 Yui Yaegashi's paintings are consistently modest in scale and composition; her installations are arranged with intense attention to form - scale, color, line - of the canvas itself - and a concern with painted process. Though process and experimentation are foregrounded in these paintings, this presence is evident only via the form of a completed painting and grouping of paintings. The creation of each work is the result of a practice and progression; in the preparation of the canvas for the layering of color - form in practice.